Maccaferri’s Terramesh System was used to form the Nova Subida da Serra (NSS) project in Rio de Janeiro. The two structures that were built for the project measure an impressive 15 m and 30 m in height. The Nova Subida da Serra (NSS) project in Rio de Janeiro, is one of the country’s most important road infrastructure projects. Maccaferri’s Terramesh System provided a solution to enable the successful construction of the highway alongside an environmentally protected area. Under the administration of Concer, the work required a solution that did not involve work in front of the wall. The choice of Terramesh allowed for an almost vertical construction using material excavated in the work as filling. Located next to the Belvedere, the structure is composed of two walls, one measuring 30 m in height and another measuring 15 m. Considered as an important investment of Concer for the Brazilian road infrastructure, the work used 85,610 m³ of stone, 4,290 m³ of which was used to fill the gabion cages which form the integral fascia unit of Terramesh. An additional 81,320 m³ of stone was used for fill. The Terramesh System consist of pre-assembled units of double twisted wire mesh (8×10 type). The facing section of the unit is formed by connecting a back panel and diaphragms to the main fascia unit, thus creating the rectangular shaped cells used for the fascia stone confinement. The geogrid reinforcement, fascia and lid form one continuous panel of mesh. Terramesh System units are supplied in standard lengths, and do not require cutting on site. The NSS took into account the curves of the current track and environmental preservation area. Given these parameters, the slope curve had to be as close as possible to the limit of the preservation area. The duplication will be part of the stretch of BR-040, whose total coverage goes from Rio de Janeiro to Juiz de Fora, comprising 180.4 km. The project aims to provide a modern track with less winding curves to replace the current stretch which was opened almost a century ago. 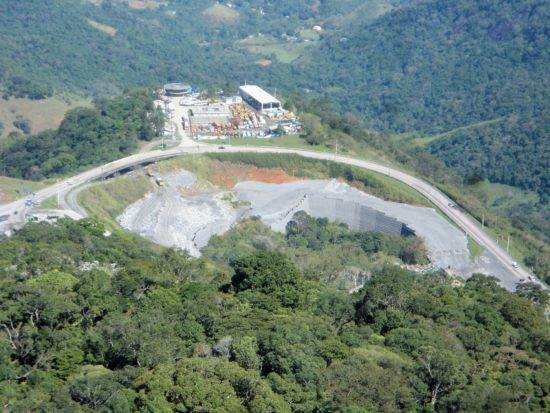 For more technical information, please download the Case History present on the website of Maccaferri Latin America.